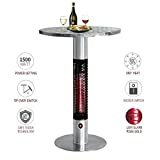 Enjoy the evenings outdoors on your patio even in chilly weather with this cool new Bistro Table Infrared Heater. 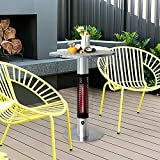 This bistro-style outdoor table has a unique pedestal base that is actually an infrared heater that warms all sitters around it with warm radiant heat from its electric carbon filament lamp. In addition to warmth, it also features a built-in LED light that illuminates the tempered glass tabletop. 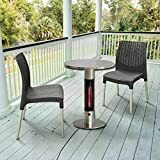 It has an IPX24 water-resistance rating making it perfect for the outdoors on your deck or patio all year long. Yep, now you can enjoy sitting on the patio in a winter snowstorm. LED rated for 5,000 that illuminates the tabletop.